Are you looking for a Locksmith in the Bodmin area, then look no further. A full list of our services can be found on our web site. Beacon Locksmiths your local Locksmith based in Bodmin, Cornwall. You can find our full Address details at the bottom of this page. You can now get your car keys cut and chipped with us as we now have one of the leading chipping machines on the market covering a large number of Transponder keys. Looking for a locksmith in Cornwall? We not only cover Bodmin but all areas in Cornwall, Please see the list below. We can help you get back in to your house, no matter what time of the day or night! Our services also include a repair service if your house has been burgled or your locks damaged. We can install new locks and advise you on additional security features such as security chains and door entry systems as well as new and additional locks. We cover all Emergency Call outs. We specialize in old locks, Keys can be made by hand to fit all old locks with missing keys, we also have a large selection of ornate keys from church locks to wardrobe locks. Old locks can be serviced and made to work like new. Our customers have come to rely on the quality of service we provide and our commitment to excellent customer service. 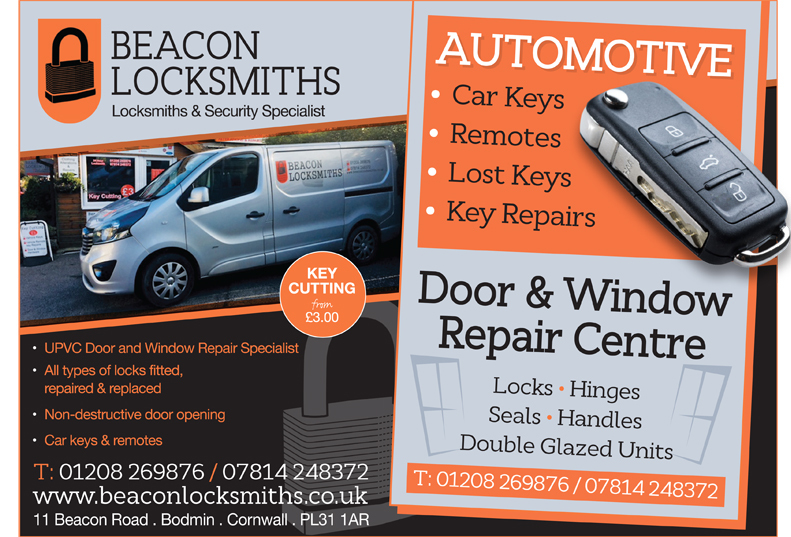 Beacon Locksmiths, 11 Beacon Road, Bodmin, Cornwall, PL31 1AR. You know exactly who we are and where we are don't be misled by National companies calling themselves Bodmin Locksmiths. No Rip Off Prices, No 0845 or 0800 Numbers a Local company that you can Trust. Looking for a locksmith in Cornwall? We not only cover Bodmin but all areas in Cornwall. We can help you get back into your house or car, no matter what time of the day or night! If you have lost your car keys in cornwall, we offer a vehicle replacement key service. We are adding to our list of vehicles daily. we specialise in Ford keys. we are able to cut and code keys for your car even if you have lost your key.